Stash Tea, one of the largest specialty tea companies in the USA, announces the release of six great tasting new teas made with a rare, naturally caffeinated herbal tea known as Guayusa (gwhy-you-sa). Guayusa is a stimulating herb native to the Amazon Rainforest of Ecuador where it has been part of the indigenous culture and cultivated for more than 2000 years. Guayusa is delicious. It has a naturally smooth taste and a rich and earthy aroma and slightly sweet finish. Guayusa is also naturally caffeinated and has an energizing effect similar to coffee or Yerba Mate, but unlike coffee or Yerba Mate, Guayusa provides a slow release of caffeine for alertness and energy, without the jitters or sudden caffeine crash. Guayusa also supports small farms in Ecuador and it helps the Amazon Rainforest thrive, as Guayusa is shade-grown. Stash Tea offers a Pure Guayusa Tea, as well as five signature blends, all organic and 100% natural. Guayusa Tea with Chocolate -- Natural chocolate combines with refreshing Guayusa for a dessert-like tea that's rich and stimulating. 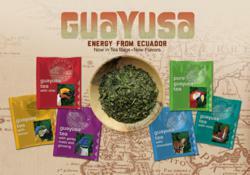 Guayusa Tea with Chai -- Ecuador meets India in an aromatic blend of smooth Guayusa and spicy Chai. Guayusa Tea with Yerba Mate & Ginseng -- are paired for an invigorating blend that is sure to awaken the senses. Guayusa Tea with Lemon -- Lemony herbs and natural lemon oil combine for a slightly tart, refreshing taste. Guayusa Tea with Mint -- Peppermint and spearmint are paired for a refreshing, rejuvenating taste. Each package contains 18 individually wrapped tea bags. All natural ingredients. QAI and USDA certified organic. Guayusa is also fair trade certified. Suggested retail is $4.95. The new Guayusa line is now available on the Stash Tea website, http://www.stashtea.com, and will be available at select Grocery and Specialty retailers nationwide. Stash Tea prides itself on providing superior quality teas. Based in the Portland, Oregon area since 1972, Stash Tea uses only pure, 100 percent natural ingredients in its full line of traditional black, green, white, oolong, flavored, spiced, herbal and specialty iced teas. For more information about the new Stash Tea line of Guayusa teas, or for samples, please contact Megan Rolerkite at Stash Tea.